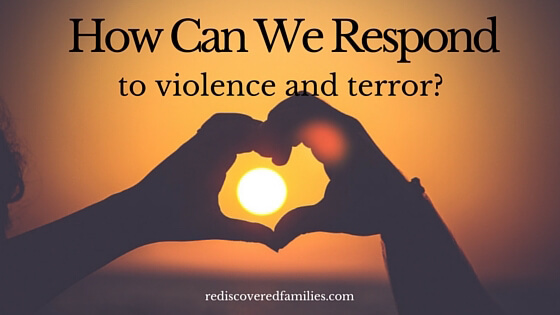 How Can We Respond to Violence and Terror? My heart is heavy with the news from Paris. My thoughts and prayers go out to the people caught in the terror. I can’t imagine how terrible it must be for the families whose loved ones have been brutally killed. I’m angry, heartbroken, and afraid. Sometimes it feels as if the forces of terror and hatred are too strong. And it is easy to feel hopeless in the face of such violence. This story started 30 years ago in the midst of a reign of violence and terror that seemed strong and unstoppable to me. I grew up in England in the 70’s during the “ Irish troubles.” The Irish Republican Army waged a war of terror and it was terrible. This wasn’t a fight in another country. It came right to my front doorstep. When I was 15 the IRA targeted my town. They hid and detonated bombs in two separate pubs. Five people were killed and sixty-five others were injured that night. These establishments were only ten minutes away from my house. It was terrifying. If anyone had told me that peace would come to Northern Ireland I would have scoffed. On 10 August 1976, a mother and her four children were hit by a car. Soldiers had just shot and killed the young driver. The mother was the only survivor. All four of her children were killed. The next day 50 other mothers responded to this tragedy. They showed their solidarity with the grieving mother by marching with baby carriages to protest the ongoing violence. That evening the slain children’s aunt appeared on television pleading for an end to the violence. Other mothers joined the protest. Four days after the incident, 10,000 women, both Protestant and Catholic, marched with banners to the graves of the children. These women endured ridicule, physical assaults, and verbal threats from those who wanted to continue the violence. The peace marchers would not be deterred and the following week, 35,000 people marched to show their support for ending the violence in their country. All because some brave mothers said NO MORE! And started to reach out in love their neighbors. They became a rallying point for all the other mothers who were tired of seeing their children killed in senseless acts of terror. And the forces of violence could not stop them. And the forces of bitter hatred could not stop them. And the forces of fear could not stop them. “We have a simple message to the world from this movement for Peace. We recognize that there are many problems in our society, which are a source of conflict and violence. It is time for us to hold up this peace declaration and make it our own. 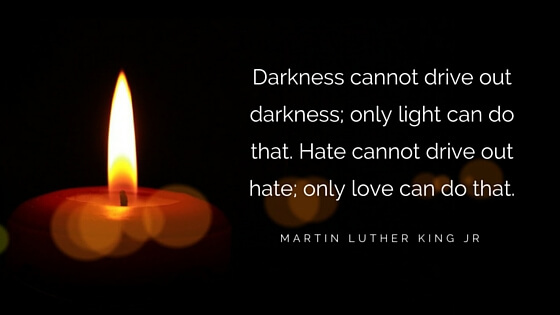 It is our turn to live and love and build a just and peaceful society. It is already starting. Hours after the attacks Parisians were opening their homes to anyone that needed a safe haven. Love wins! People all over the world are on their knees praying for peace. Love wins! “I’m writing this backstage at Allegiance, my heart heavy with the news from Paris, aching for the victims and their families and friends. “There no doubt will be those who look upon immigrants and refugees as the enemy as a result of these attacks, because they look like those who perpetrated these attacks, just as peaceful Japanese Americans were viewed as the enemy after Pearl Harbor. But we must resist the urge to categorize and dehumanize, for it is that very impulse that fueled the insanity and violence perpetrated this evening. Let us declare that we want lives of joy and peace for our families. Let us find the dedication, hard work, and courage to build that kind of a world. So hold your loved ones close today. Then get to work with your neighbors to build a peaceful society. We can’t do it alone, but together we can rise up in love. And together we can bring peace. Beautiful post Sharon. It brought tears to my eyes. Thank you. So true – strength in numbers and a united front can be unstoppable. Lovely post showing what strength and love can do.